ok. i totally struggle with picking out outfits for christmas cards and we don't even have kids yet, who's with me?! 1. think about home decor. usually these photos are to hang up in your home so think about decor you may have! for example, our home is pretty neutral...woven baskets, greys, plants, beige, macrame etc. so our outfits are pretty neutral here. 2. accessorize! to throw in some color i got this bandana from madewell and i feel like it was the perfect amount of "pop". plus they have a million pretty colors to choose from! i also got a ton of questions on my dress so here is the link to my dress! it was a toss up between the dress i am wearing and this dress. 3. pin pin pin. pinterest is the best. look for different color schemes and examples of family photos you like! be careful though, pinterest will hook ya. (i spend too much time on it!) if you see yourself spending too much time on it, you will loose your authenticity because you're trying so hard to look like someone else! be YOU! 4. think about your location. where are you taking your photos? what colors go well with the background? 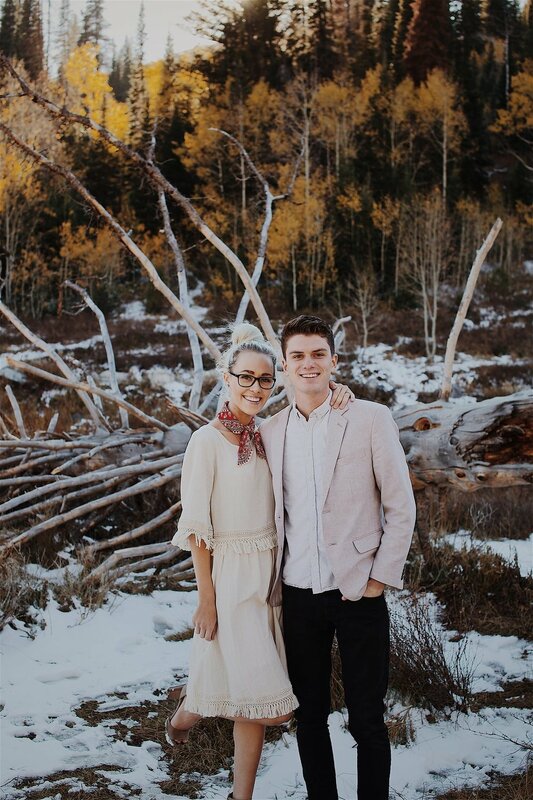 we went to big cottonwood canyon and the colors were so pretty, we didn't want to clash with the beautiful fall colors so we just went with neutrals.